Do you tighten up, get scared or have doubts about your skills before you go into the ring or on the course? If so, you might benefit from mental game coaching for peak performance. Many equestrians struggle with their confidence or nerves in competition. See if any of these statements sound familiar? I’m so frustrated with my performance that I should give up! I feel as if I start to doubt my skills when I go into the ring. No matter how much I practice, I don’t get the same results in competition. I wish I could stop focusing on other competitions when I compete. I perform tight, scared, tentatively or try to not make mistakes in competition. Dr. Patrick Cohn is a master mental training expert at Peak Performance Sports. Dr. Cohn works with athletes and teams worldwide from a variety of sport backgrounds including equestrians and coaches. As the president and founder of Peak Performance Sports (Orlando, Florida), Dr. Patrick J. Cohn is dedicated to instilling confidence and composure, and teaching effective mental game skills to help equestrians perform at maximum levels. In addition to working with equestrians, Dr. Cohn teaches parents, coaches, and athletic trainers how to help equestrians achieve peak performance through mental game skills. If you are tired of under performing when showing, you can get expert mental coaching from anywhere in the world. Meet with us via Skype, phone, FaceTime, or GoTo Meeting. With today’s video technology, we are able to connect with athletes and coaches all over the globe. Consistently take your practice into every competition. Use prering routines to raise the consistency of your performance. Learn mental strategies to let go of mistakes and stay calm. Manage competitive distractions and perform with a laser-like focus. Don’t spend another competition under-performing or performing tentatively. 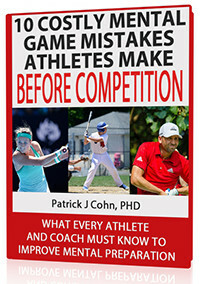 You can improve your mental game with master Mental Game Coach, Dr. Patrick Cohn. You can opt for one-on-one sessions with Peak Performance Coach, Dr. Cohn in Orlando, Florida, or you can get coaching from the comfort of your home – from anywhere in the world – via telephone, Skype, or video-conferencing.